An attitude of near imbecility slowly creeps across and clouds The Old Bookworm’s visage. The appearance of pained concentration – as if he’s trying to work out the sum of 764 divided by 13.5 – is, I have come to realise over the years, not the cause for alarm I had once assumed it must be. Rather, it is the Bookworm’s rather endearingly studied attempt at conveying a sort of high brow, intellectual enrapture. 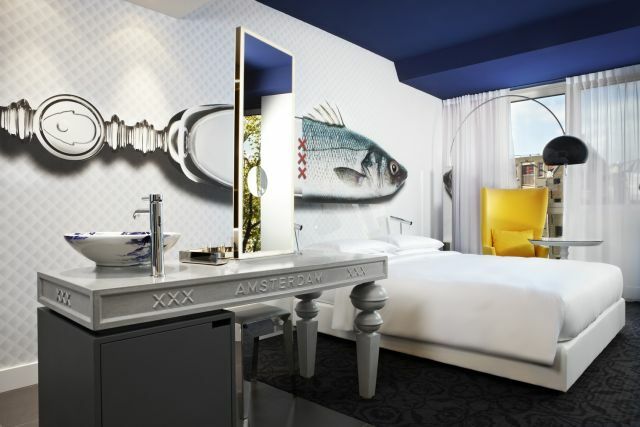 Reader, I own I had expected it; we were, after all standing in a former public library, re-opened last year as the Andaz, Amsterdam’s most swish and stellar new hotel in a prime spot between the Prinsengracht and the Keizersgracht canals. The Old Bookworm was trying silently to communicate, dear thing, that he felt he had come home. Wishing to shake him out of this particular affectation, I briskly herded him towards the lift and up to our room for a splash of cold water to the face and a few words of brusque no-nonsense. It was to no avail, for the glass elevators at The Andaz did little to quell his excitement. 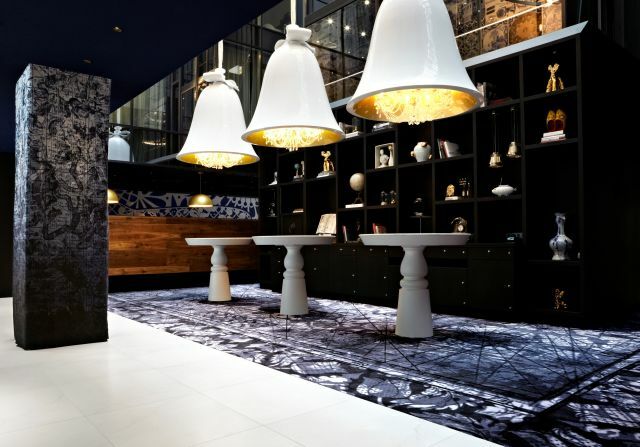 The books that appear to be its wallpaper give way – as the lift makes its ascent – to a series of extraordinary hanging sculptures that light up as you go, while the reception stands at the hotel’s impressive entrance take on the appearance of vast hanging white bells when seen from above. The rooms, meanwhile, come complete not only with spectacular views over the canal below, complimentary mini bars, an edited collection of books and sublimely comfortable beds, but also with be-wallpapered loos featuring quotes from some the antique texts once housed under this roof, extravagantly sweeping floor lamps, cocoon-like armchairs and a huge surrealist cut-out of a fish transforming into a spoon which hangs over the bed. But then, this is the vision of Moooi co-founder and design magazine darling Marcel Wanders – upon the learning of which The Bookworm noted: “And he certainly has created a Wandersland” – before looking very pleased with himself indeed. I can’t deny that The Old Bookworm has a point, even in his absurdity. 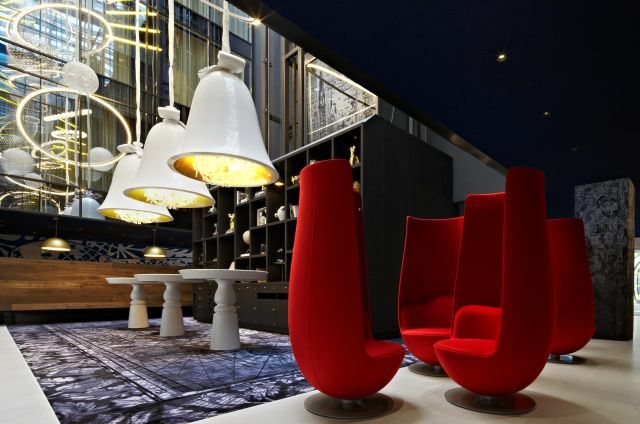 The Andaz is all easy charm – its staff are perennially smiley and helpful – and outlandish, witty style (there are whimsical allusions to Dutch heroes galore). Check-in is dealt with over an iPad and a drink on the sofa; in the early evening there is an annexe where guests can help themselves to complimentary wine before dinner. This is a hotel that knows how to do things properly. Wondering whether the Bookworm’s more pronounced-than-ever silliness might be down to the lingering effect of the flight and an empty stomach, I shepherded him to dinner at the hotel’s Bluespoon restaurant, where we take our pew just a metre or so away from the open kitchen where the unflappable chefs – under the tutelage of Swiss Julien Piquet – busily knock up our knock-out dishes. Having greedily devoured our way through some spectacular home-baked bread with salted butter, we both opt for a light salad of courgette flowers which is artfully executed, its flavours as dainty as its presentation. But not for long could the Bookworm – who is, you see, an old school, napkin-tucked-into-his-collar nursery style sort of chap – be denied his pound of flesh. His wolfed down steak tartare which was judged a triumph (or at least his satisfied grunts indicated so; it was all I could do to stop him picking up the plate and licking it clean. Reader, I ask you…) Anyone else might have been replete after such a hearty repast, but the Bookworm’s eyes have rarely been more alight with excitement than when he spied the enormous bowl of chocolate mousse being brought over towards our table – until, that was, the crashing disappointment at the realisation that the entirety of the bowl was not destined solely for his gullet. Feeling refreshed the next day, I suggested we take up the city’s traditional mode of transport by borrowing one of the hotel’s bicycles. Reader, it was not to be. The Bookworm could barely cross the road in the face of so many cyclists without having a panic-induced fit, let alone join them. And so to settle both of our nerves (his cyclist-related, mine Bookworm-related) we decided on a swift half pint at the excellent Café Gollem before a spot of culture. To this end, we made for the Rijksmuseum, which has reopened after a decade-long refurbishment. It boasts a formidable assembly of world-class art, most notably Rembrandt’s The Night Watch, but being a simple creature, The Bookworm mostly enjoyed the display of 17th-century Dutch drinking horns, his fun mostly derived from deciding which of the merrymakers depicted in the accompanying paintings of old soaks he most resembled (in too many cases the similarities were uncanny). 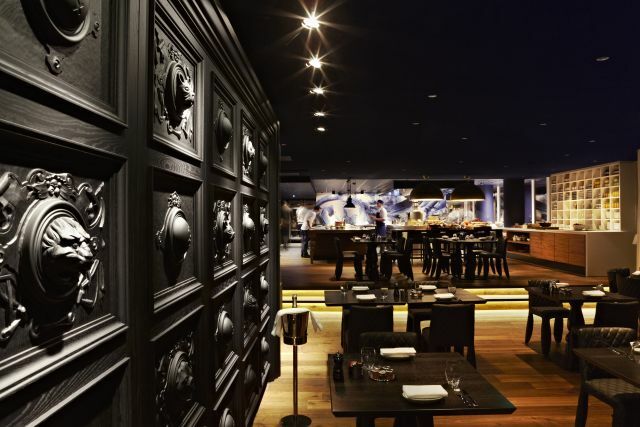 All this art admiration is thirsty work, and so we headed to one of the city’s trendiest restaurants, Lion Noir, where we had a sumptuous dinner that disproved that the old adage about Dutch cuisine being tired and potato-laden. Reader, we shall be back. As the bookworm and I sauntered down one of the city’s many canals (and I resisted the urge to push him in), we heard a gentle sound. A musical, faintly discordant noise, I wondered what it was. Perhaps it was the faint hum of Amsterdam’s red light district in full swing, or maybe it was the distant echo of a barge, carrying its precious cargo around the towering gables of the houses around. And then I realised it was the silly old bookworm’s stomach rumbling and had to have words with the foolish boy again.